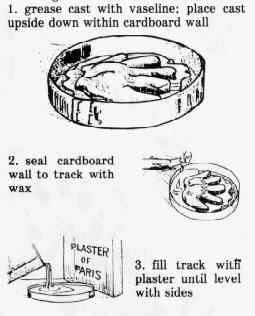 Tracks may be collected using either the WAX or the PLASTER method. Experience is the best teacher in this but generally speaking wax is better in dry ground situations and plaster is better in all others. Wax: Select the track to be collected and brush out loose dirt carefully. Light the candle and drip wax into the impression. Allow a rim of wax to form around the edge of the track as well as in the impression. This will strengthen the mold. When the wax has hardened remove the track and surrounding soil with a trowel. Wash away soil with water; dry track impression. What you now have is an impression of the foot that made the track, not an impression of the track. Plaster: Select the track to be collected. Mix the plaster of Paris to the consistency of whipping cream and pour into the track impression. After the plaster has set, dig out the impression. Handle with extreme care. It takes several days for the plaster to set firmly and dry out. Once dry, the excess dirt may be brushed off. This is an impression of the foot that made the track. To mix plaster: It is convenient to carry the plaster in a double plastic bag. Use an extra plastic bag for mixing. Put into the bag the desired amount of plaster, add water and mix to the consistency of whipping cream by squeezing the plastic bag. Use an eye dropper to syringe water from tracks before casting them. 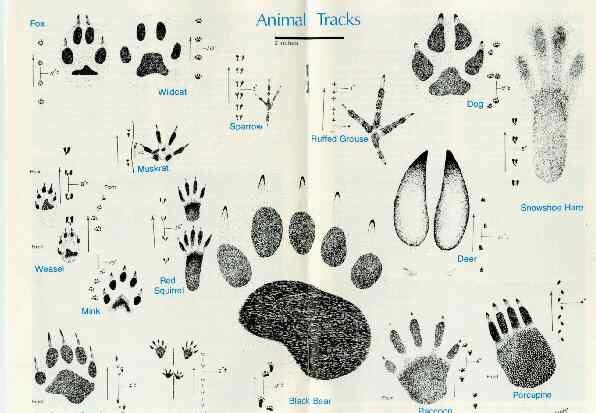 Small tracks (i.e. bird or small animal) should be poured an extra =" deep to give the casting extra strength. This can be done by placing a paper collar around the track. Tracks in wet snow: sprinkle with dry plaster. Allow this to set. Fill the track gently with the plaster of Paris mixture. Tracks in dry fluffy snow: spray the track with water. Allow this to freeze. Fill the track gently with the plaster of Paris mixture. It is important to pour gently in order to avoid deforming tracks in fine snow or dusty ground with the weight of the plaster. Plaster mixed too thickly will not run into all of the contours of the track, hardens too quickly and the finished impression is weak and soft. Plaster mixed too thinly runs into the track contours well but hardens too slowly. The finished impression is brittle and cracks easily. When casting in below freezing temperatures the plaster will freeze a bit before hardening. When the casts are returned to a warm place they will then thaw and become wet to the touch again. Handle carefully and allow to cure in the normal way. if wax is used for original impression, use hair dryer or mild heat to melt wax away from plaster. click here for a diagram .